The Guernsey is a fawn or red and white in colour and originates from the island of Guernsey in the Channel Islands and is a docile in temperament and a hardy breed. The Guernsey is a long-lived breed that offers easy calving, grazes well and is relatively small in size and an efficient milk producer. In recent years they are frequently larger with longer legs due to prolific crossbreeding with Holstein–Friesian cattle. The Guernsey is a dairy breed which produces milk with a golden-yellow tinge which is due to the high content of B-carotene a provitamin for vitamin A. Guernsey’s produce around 6000 litres of milk a year, the milk has a high protein content of around 3.7% and high butterfat of around 5%. Guernsey bulls weigh 600 to 700 kg with strong back, wide rump and deep barrel, broad loin with evenly balanced, symmetrical quarters. The bull has ample vigour and masculinity. Heifers typically come into milk at around two years old and for both heifers and bull calves, the average weaning weight is 75 kg. Guernseys have high milk flow. The Guernsey has a high food conversion rate and produces their high-quality milk with 20 to 30% less food per pound of milk than larger dairy breeds. 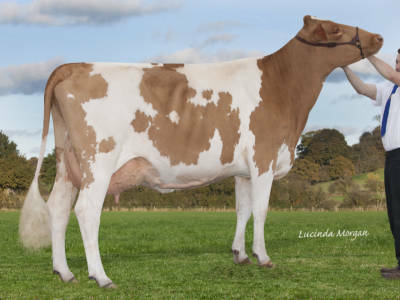 Guernseys calve at an early age from around 22 months, thus providing a quick return on investment. Their calves are big at birth and easy to rear with little or no calving issues. Their milk contains 12% more protein, 30% more cream, 33% more vitamin D, 25% more vitamin A and 15% more calcium than average milk. According to research conducted in the USA, 60% of Guernseys carry the Kappa Casein ‘B’ gene, this is highly beneficial for cheese production as it offers increased quality, production and a firmer curd.